The MoistureLevel Smart Foundation System was developed to alleviate problems caused by expansive soil beneath concrete slab foundations. Borrowing from radon mitigation technology, the foundation repair method uses a fan and plastic pipe to create air movement and suction on the under-slab soil. The introduction of outside air on the damp soil causes evaporation of the excess moisture. The newly dried soil reduces the soil expansion and resulting foundation damage. Cut off walls is one method that has been a standard accepted solution by most local forensic geo-technical engineers. This method involves trenching around the perimeter of the house or building to a depth recommended by the geo-technical engineer. Then a very thick layer of plastic is installed, which is run up along the trench and adhered to the base of the foundation. It is then backfilled with either grout or soil cement. Depending on the situation and the location of the house, we often use this method, as well as helical piers, to fix failing foundations. Since we've opened our doors in 1988, we have seen the most movement with soils in areas surrounding the valley. With the proper design on a new construction project, the addition of a cut off wall can allow the structural engineer to reduce the thickness of the concrete and decrease the spacing of the cables on a post tension slab. It can therefore pay for itself with initial costs in addition to providing for a better protection against heave or settlement. Several years ago one of our clients approached us to solve a particular problem of which no existing solution existed. 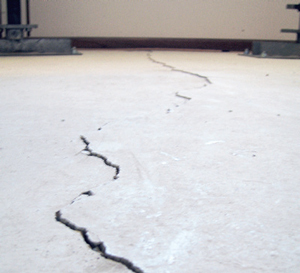 An existing post-tension slab had experienced a large differential edge heave that was bringing severe damage to the house. A manometer survey indicated that it had as much as 2 ½ inches of floor elevation difference. Because of the geography and climate in the Greater Phoenix area, heaving is much more prevalent than settlement in a residential setting. Many of the symptoms of a heave are mistakenly misidentified as settlement, resulting in scopes of repair that many times are not consistent with what is really needed. With over a decade of experience, we have developed and patented a proprietary process for excavation that can level, restore and protect a home or other structure from differential heave. Piering around the heaved area. Excavating under the footings and floor. Grouting back in ribs 5' on center. Installing a cut off wall around the perimeter. Backfilling and restoration as needed. As a locally owned and operated foundation repair company, we understand the ways that soils in Arizona affect the homes they surround. Our team of in-house foundation contractors is ready to meet with you to explain what's happening with your foundation -- and how to fix it. To help you decide, we provide each of our customers with a free, no-obligation on-site inspection, before you spend a dime with us. Each inspection includes an on-site inspection, a personal consultation, and a detailed proposal on how we can work to fix your problem. We proudly serve Glendale, Scottsdale, Mesa, Phoenix, nearby areas such as Scottsdale, Chandler, Sedona, Payson, Flagstaff, Peoria, Prescott, and the entire state of Arizona of AZ.